Its leaves are similar to a Donkey's Ear plant but the stems have milky sap like the euphorbia. 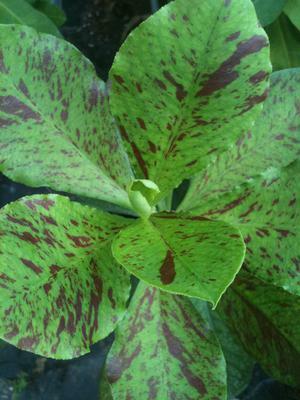 There are a couple of Euphorbia that have similar leaves, with the variegation. The dead giveaway is that latex like sap, so you're definitely wise to give this plant lots of respect. This plant looks more similar to the Devils Backbone plant, which has the same type of leaf - less fleshy than the Donkey ears which is actually Kalanchoe gastonis-bonnieri, not Euphorbia. Your plant appears to be Euphorbia bicompacta var. rubra, also known as African Milk Bush, Purple Leaf Brown Jug Plant, Tanzanian Red Milk Bush.